Before you can display a coupon on your website you must create one first. From your WordPress dashboard navigate to Coupine > Add New. 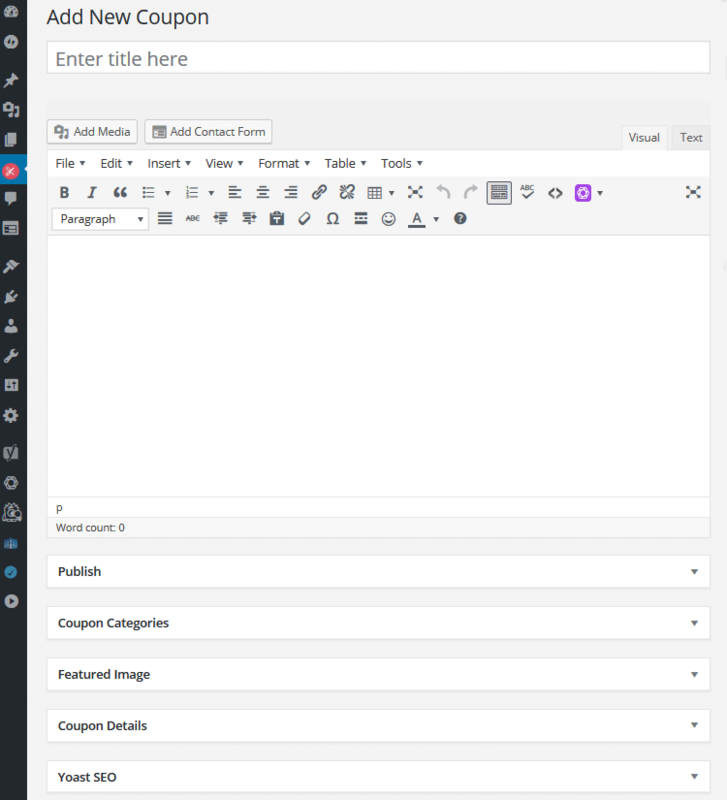 You will be directed to a WordPress editor screen much like you would see when creating a new post or page for your website. Compose any text you would like added to the coupon such as product or service information, coupon codes, and what the reader will receive when using the coupon. Add any relevant images you would like to include within the content. Designate any Coupon Categories associated with your coupon. Fill in the Coupon Details including the coupon code, discount value and type, and affiliate redirect URL. Optimize your coupon if you have a dedicated SEO plugin such as Yoast SEO. Select Save Draft to save all of your changes. Now that you have created your coupon and customized it to your liking it is time to locate the associated shortcode for entering into your website’s post or page. 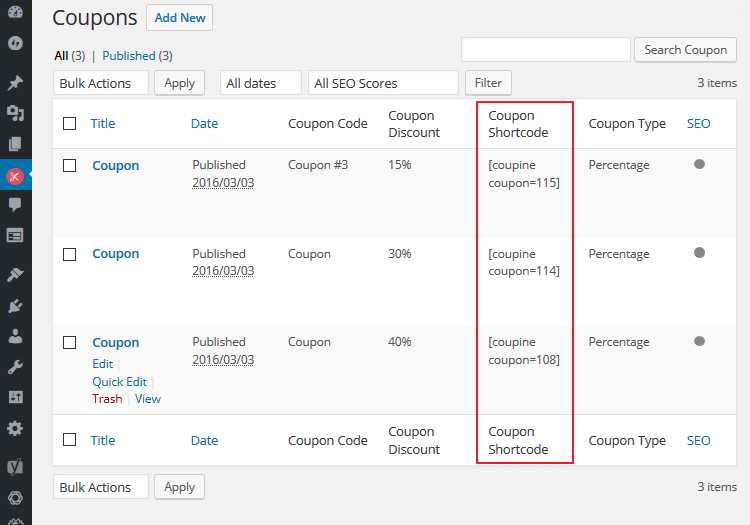 From your WordPress dashboard navigate to Coupine > All Coupons. You will then be directed to a screen labeled Coupons. This screen will list all coupons you have created in the past. Each coupon that has been created will have several useful pieces of information listed next them. This includes the title of the coupon, the date the coupon was published, the coupon code you assigned it, the coupon discount value, the coupon shortcode, the coupon type you assigned it, and the SEO score if you have a dedicated SEO plugin such as Yoast SEO. Each coupon you create will have a unique shortcode assigned to it that helps identify that particular coupon and allow you to display it on any post or page in your website. Once you have identified the shortcode that is associated with the coupon you would like to display on your website’s post or page simply copy it either by highlighting it, right clicking your mouse and selecting copy, or by highlighting it and selecting Ctrl c (Command c for Mac). Then navigate to the existing page or post you would like to display your coupon on by navigating to either Pages or Posts in your WordPress dashboard and selecting the appropriate page or post. If you do not have an existing page or post you would like to display your coupon on, navigate to Pages &gt; Add New or Posts &gt; Add New. 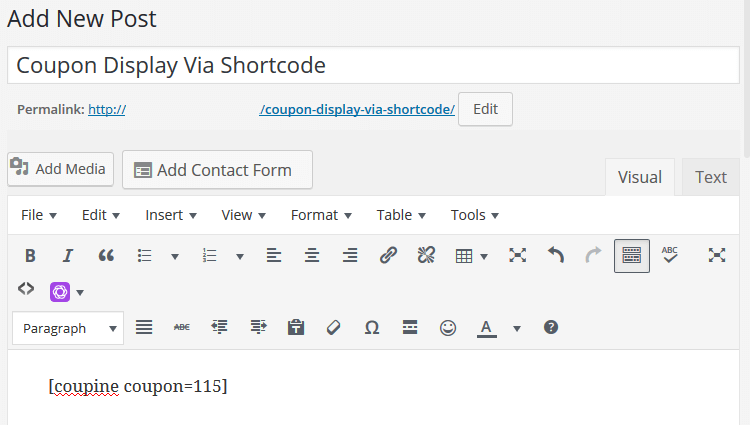 Once you are on the page or post you would like to display your coupon on, simply paste the coupon’s shortcode in the text editor section where you would like the coupon to display. By right clicking your mouse and selecting Paste (Command v for Mac). Once the coupon’s shortcode has been pasted into your page or post, select Preview to make sure it looks how you had intended it to. If everything is to your liking you can now Publish your coupon or your readers to see when they visit you website!